Burns was born in Alloway in 1759 and was the eldest of seven children. In 1784 when his father died he became partners with his brother on the farm, but he was more interested in the romantic nature of poetry. Before running away to the West Indies to marry his girlfriend Jean Armour his poems were published. This was a great success and when he went to Edinburgh he was treated as a national celebrity. It was in Edinburgh that his second edition of poems was published to great acclaim and he received attention from all ranks and description of persons. On the 28th November 1786 when Robert Burns arrived in Edinburgh its gates were flung open to him. He stayed in Baxter's Close in a house which has been demolished and is now Deacon Brodies Tavern. He was known in the illustrious circle of artists and writers as the 'Ploughman Poet' due to his earlier life when he had worked on his father's farm. He died at the age of thirty seven and around ten thousand people attended his burial. Every year the Scots still celebrate his birthday on January 25th as a remembrance to a great poet. 'Burns Night' is celebrated with a meal of Haggis, Neeps & Tatties. 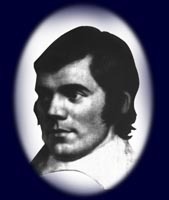 Before the haggis is cut open, Burn's poem 'Address to the Haggis' is read where he refers to it as "chieftain of the Puddin' race" meaning Chief of all puddings. His best known work 'Auld lang Syne' is sung at New Year the world over.